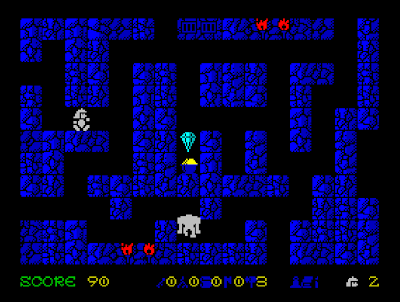 I approached this release with some trepidation – a previously unknown the two man team Lasasoft's debut release for the Spectrum – and it looked from the screenshot like something that was evidently based around typical Spectrum 8x8 character squares, with a rather bland tile set of 'generic dungeon'. My expectations were low, and the lack of loading screen and minimal front end menu did little to increase my confidence. So, what have we got here? 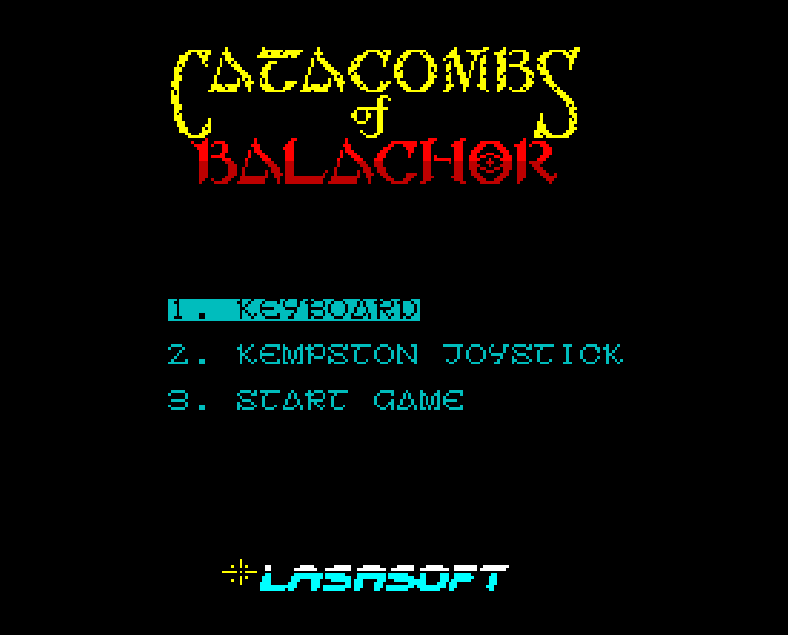 Catacombs of Balachor is a fairly simple flick screen arcade maze adventure that seem to take Ultimate's SabreWulf or AticAtak as inspiration. 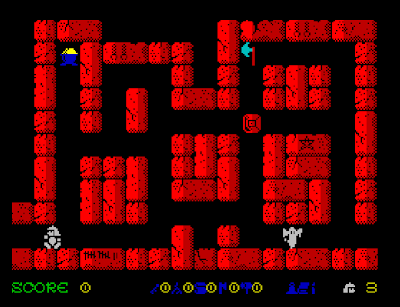 Rather than having any weapon, the hero has to avoid baddies and progress through the Catacombs collecting treasure, to finally escape. Although nominally a maze it differs from the Ultimate offerings mentioned in that progression is fairly linear – it is hard to get lost, and locked gates prevent you from backtracking too far. These are not criticisms, and some players will relish the face that navigating the dungeon is not too taxing. There are locked gates which require collected keys, and some parts later that require axes to progress etc., but most players will strip-search the rooms, so the ‘collection’ and managing the right tools to progress becomes secondary to just avoiding the baddies and collecting everything. A few hidden rooms spice things up, but they are easy enough to spot, if you search carefully. 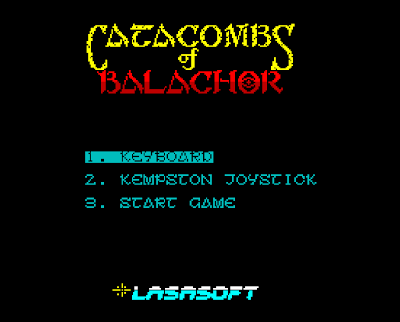 Despite its simplicity of design, Catacombs of Balachor was a rather enjoyable distraction, with the fast pace of the random moving baddies making it enjoyably tricky through some of the nastier rooms (and somewhat of a lottery in places). 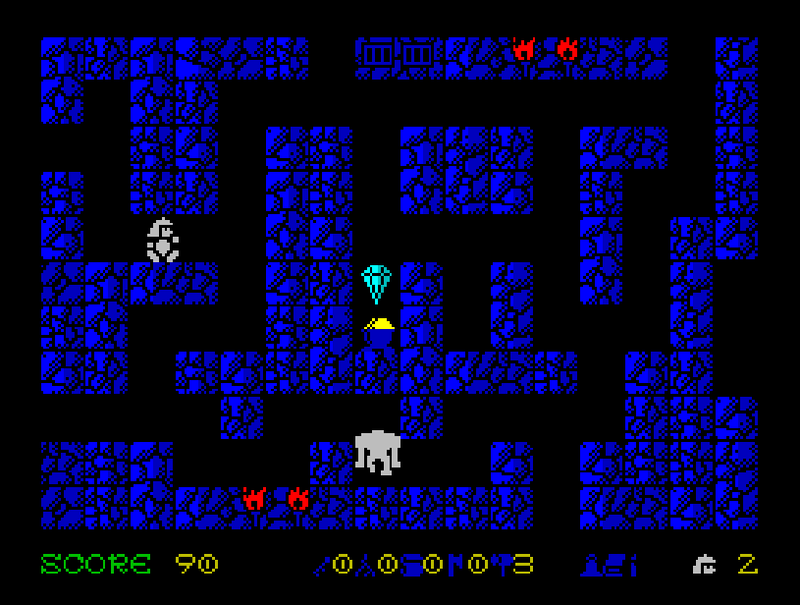 A Golem creature that sometimes appears follows you off the screen, and some strategy can be employed by leading him away from trickier rooms to tackle them. The number of lives is tight to get through this game, although with care it is fairly easy to get close to the end of the 50 odd screens. The actual ending lacks much in the way of ceremony and echos the lack of polish shown on the menu, unfortunately. Graphics are very nicely done throughout, and I was pleasantly surprised to find that the boring titular dungeon rooms soon give way to a castle, and then jungle setting (which is very difficult not to think of as like SabreWulf), before the final couple of screens. The dungeons and catacombs themselves are the most identikit feeling of the locations, which is a shame, as this may stop some players from seeing the (nicer looking) castle and jungle areas. My initial misgivings about the presentation, and a rather light feature set, still hold – but this is tempered by the game actually being rather enjoyable to play – which is, after all, the point. As a debut release, Morkin (programming) and Rothron (graphics) should be congratulated on making something that at least kept me playing to its conclusion – it's very light, enjoyable, and insubstantial - but so is a well made meringue. And there is nothing wrong with enjoying meringue now and then. 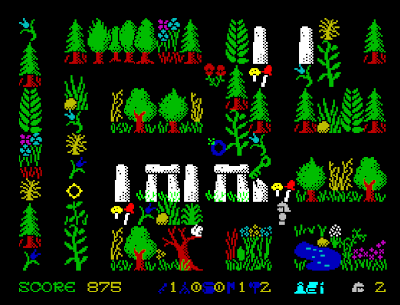 Download the game from here (from the World of Spectrum site).